just two years after the "new" school was built. Rock Hill School, (RHS), is nestled among natural meadows beside a winding country road approximately four and one-half miles south of Lebanon, Oregon on its original location. Large oak trees shade the knoll in back of the school, sheltering it from the prevailing rains of winter. There is a sweeping view of rolling farmland, scattered buttes and the mountains of the Coast Range, with Peterson Butte dominating the view to the northwest. RHS symbolizes a way of life in the Willamette Valley in the 19th/20th century when pioneers began to arrive. Schooling was highly valued and viewed as the path to the future. 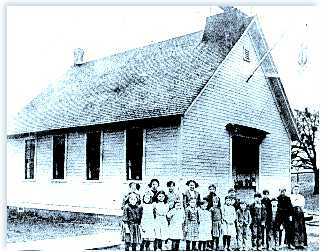 The schoolhouse was the most important building as it also served as a gathering place, social/meeting hall and a church. Exhaustive research has indicated that the current school was built in 1910. RHS may be the oldest of the nine remaining schoolhouses intact and on their original sites and is the best example of an on-site, rural school building in Linn County. The first official school districts in Linn County were organized in 1854 and Rock Hill School District was one of them. The present school appears to be the last in a series of five buildings. All of the schoolhouses were located on or near the base of the half-mile ridge. The two earlier structures apparently were near the southern end of the ridge. The three later structures, including the existing school, appear to have been built on the same site at the extreme northern end of the ridge. The first schoolhouse was a log structure and might have been built before 1853. Dorissa Miller described the building as follows: "My first school was in a log cabin and we sat on slab benches which were without backs. Each bench was about ten feet long and there were no desks." The third schoolhouse was a frame church building started by the United Bretheren Church in the 1860's, on an acre of land which they purchased for $50 from William and Lydia Gallaher, but construction halted because the Church ran out of money. In May 8, 1869 the Church sold, to Linn County School District No. 31, an equal and undivided half of the acre, including the unfinished structure for $250. There was a stipulation in the deed that read: "So long as the said School District shall use the said premises for school purposes the Church shall have the preference of using said premises for religious purposes." The school district completed the church/school soon thereafter. Because of the increase in population and the need for more room, the fourth schoolhouse was built on the present site some time in the 1870's. W. T. Fogle remembers this building as being 30-40 feet, (current building has similar measurements), and during the winter there were about fifty kids attending; one winter there were seventy kids in attendance, from kindergarten to fifth reader. Sometime between 1909 and 1910 the current RHS was built. It was constructed with the main entry facing east so it would be protected from winter storms. There were two outhouses (South for the boys, North for the girls) placed to the rear of the school. The original workmanship was exemplary and possesses integrity of design materials and workmanship. It embodies the distinctive characteristics of an American one-room schoolhouse, a folk design common from the beginning of the 18th century through the middle of the 20th century. The early Rock Hill Schools were called subscription schools because public school funds were not available so the local settlers sponsored the education of their children. The parents commonly signed a contract with the teacher, agreeing to pay that person a certain amount for each pupil taught. These teachers rarely had little formal training and had to teach all eight grades in a single room. Ages of students often ranged from four to twenty. 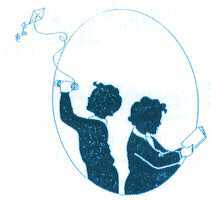 Fogle recalls- "The principal text book - in fact the entire curriculum of the younger children - consisted of the long since discarded blue-backed Webster's Elementary Spelling Book, a collection of widely divergent spelling and reading lessons." In the early days the school year lasted only three months or less. Older students were needed to sew, card wool, churn butter, milk cows and help with planting and harvesting. Roads were often flooded or deep in mud. Teachers generally boarded with local farmers. Over the years the John Nichols family (who purchased the Gallaher farm on October 23, 1873) boarded the school-mistress. They lived in the house northeast of the school so it was a convenient location. 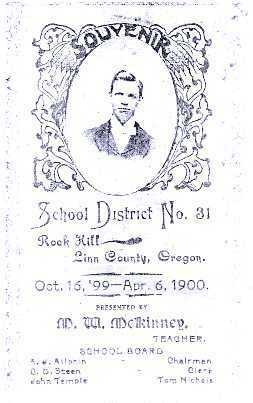 This family was very supportive of the local school, for two descendants of settler John Nichols were listed as members of the three-man RHS District Board of Directors in separate annual reports, (1899-1903) of the Linn County School Superintendent. Most of the early teachers were men. "Old Man" Gallaher (to distinguish him from other numerous members of the family), James Jackson Gallaher around 1860 ("Jack" was the one-armed teacher who lost his arm in a threshing accident), W. R. Bishop taught 1856-1861 (founded Bishop's Academy), Nimrod Price Payne, (an outstanding pioneer developer of Linn County), James Knox Polk Weatherford (elected to the Linn County School Superintendent in 1874, the bar in 1875, State Legislature in 1876 and 1884 became a State Senator, was the most illustrious). Lydia Frum taught for four months during 1898-1899 and had 36 students. Olivia Sorenson taught 41 students about five and one-half months during 1901-1902, however her average daily attendance was 23 students. Their comments in summated reports which were preserved were: the poor condition of the "water closets," grounds not suitably improved, the supply of good water was not ample, the woodshed was in poor condition, the ventilation was not very good and the lack of fencing. Statistics averaged for Linn County for the five consecutive school years ending 1899 and 1903 show that: the county paid male teachers about $40 a month and female teachers about $32 a month. Schools were open seven months a year (probably shorter for rural schools like RHS). The Wilson sisters, Norma Wilson Morgan (graduated in 1927) and Alta Wilson Ballew (graduated in 1931) shared some of the following memories about their RHS days. They grew up on a farm located West of RHS. In addition to school activities they recalled that the school was used for community Halloween parties, Thanksgiving celebrations and even debates, as well as basket socials. Norma recalled that Milton Miller, the famous 19th century graduate of RHS came from Portland to give a talk on the last day of school. Non-denominational church services were conducted by a local preacher or by a circuit rider, such as George Simons. Their father, Orvis Wilson, who was a pupil at RHS in the 1880's, served many years as School District Clerk until his death in 1938. Norma Wilson Morgan took over at that time and remained in that position until 1952 when the RHS School District ceased to exist. Late in the spring of 1935 the doors of Rock Hill School closed for the last time. It had been the local center for learning for at least eighty years. Closure was due to low enrollment. Beginning in the fall of 1935 the students were bussed to a school in Shedd. Despite its closure as an educational building the schoolhouse continued to serve the community as a meeting place during the 1940's and 1950's. On November 29, 1960 Linn County School District sold the historic acre, including the RHS to Norma and her husband, Gilbert Morgan for $206. Fearing that the building would deteriorate, they purchased it to save it for future generations. Formal recognition of the historic importance of Rock Hill School began on March 12, 1986 when the Linn County Historic Resource Commission placed the structure on the Linn County Historic Register. On April 30, 1991 thirteen individuals, many from the Lebanon and Brownsville area, met to develop plans for preserving and restoring the structure. The Rock Hill School Foundation was formed to restore the old school to its original elegance. At that time it was being used to store hay, which caused the floor to sag in places, but also protected it to some degree. There were boards nailed over the doors, the shutters hung broken at windows which had only broken glass, there was no bell in the tower and the roof was rotting away. On the west gable, the "weather side," there was an extra layer of shingles, which someone had put up to correct a water leak. The Morgans transferred title to the Rock Hill School to the Foundation and work has steadily progressed to preserve, restore and maintain Rock Hill School. When you walk into RHS it is easy to imagine a simpler time when children walked or rode their horses to school to learn to read, write and do arithmetic. If you stand very quiet in the middle of the room, when no one is there, and close your eyes, you can almost hear the children of past generations giggling and talking. If you would like to be a part of the Rock Hill School restoration, a membership fee of $25 and yearly dues of $10 entitles you to receive a RHS rock, a diploma, and the Rock Hill School Foundation Newsletter. The fees will be used to continue restoration of the building and grounds. Much has been accomplished in the last few years, but there is much left to do. We have been fortunate in having many items and services donated but some things do have to be purchased. The Rock Hill School is available for any Oregon teacher and class. If you would like to bring your class to the school for a field trip or for teaching for the day, or for information about how you can help preserve and restore this historic school, call Mel Harrington at 541-451-3027. Unless otherwise noted all pages on this website are copyrighted as follows.